Scleral Lenses in Stony Plain, AB & Spruce Grove! Home » Contact Lenses » Scleral Lenses in Stony Plain, AB & Spruce Grove! Scleral lenses are a specialized contact lenses that make contact lens use possible for many people for the first time - and they have advantages for normal contact lens wearers as well. A scleral lens is a larger lens that rests on the sclera or white of the eye, rather than the colored portion (or iris). 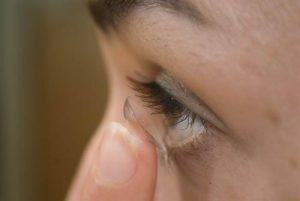 The lens has many advantages which can make contact lens wear an option for those who have previously been told otherwise. The lens, which covers a larger area than a normal contact lens, creates a pocket filled with artificial tears, fitting securely around the eye. Due to their size, scleral lenses provide sharper vision, greater durability, easier handling and a lower risk for complications. We have a unique library of scleral contact lens solutions for you. Are you one of the 5 patient types that would likely benefit from a scleral lens? High or complicated prescriptions that have been told they can't wear contact lenses. Unsuccessful history with other lenses either due to poor comfort or poor vision. Keratoconus or any type of corneal degeneration or dystrophy, transplants, scarring or trauma or post-LASIK complications. Dry eyes or high sensitivity to light or Steve Johnson Syndrome. What are the 5 main benefits of a scleral lens vs. a regular lens? Easier to insert and remove. Improved, consistent quality of vision all day long. Better comfort. Other lenses may dry out and get uncomfortable. Longer lasting. With proper maintenance, they can last over a year. What are three key differences in the scleral lens technology? The lens doesn't touch the cornea but rests on the sclera or the white part of the eye to increase comfort. Microscopic adjustments to the lenses can be made with new advanced manufacturing technology to customize the fit of each lens to each patient's unique needs. Can add highly customized, unique prescriptions onto each lens to provide even better vision. It is not uncommon for someone who is legally blind from a corneal irregularity to regain great vision. This lens design provides a protective cushion of saline that can reduce pain and photosensitivity caused by other lens designs. Scleral lenses are great for athletes who require excellent acuity and a stable lens fit while they are physically active. They are also useful in situations where other contact lens types are not effective or appropriate, including dusty environments and contact sports. Scleral lenses can provide hydration to the cornea in severe cases of dry eye and ocular pemphigoid. They can also help in keeping the eye hydrated in conditions where the eyelids do not close properly such as facial nerve palsy, trauma, or ptosis. We customize the lenses to the exact specifications of each individual wearer. The entire process may take several visits in order to optimize the design and ensure the process of application and removal is comfortable and efficient. For these reasons professional fees associated with fitting sclera lenses and lens replacement costs are higher than other contact lenses. We are happy to discuss your specific costs based on your individual needs. Please let us know if you are a new or existing patient. I-Care Family Vision & Eye Care serves Stony Plain, Spruce Grove, Parkland, Carvel, Wabamun, Acheson, Enoch, Duffield, Calahoo, Alberta Beach, Seba Beach & West Edmonton – schedule an appointment today. If you have a moment, please give us your feedback about our site and your experiences with I-Care Family Vision & Eyecare LTD.